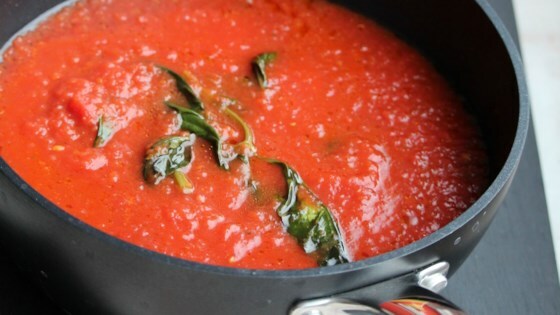 "This is a basic recipe for authentic Italian tomato sauce flavored with extra-virgin olive oil, garlic and basil. Toss with your favorite pasta or use for pizza, gnocchi and more." Heat oil in a saucepan over low heat. Add onion and garlic. Cook and stir until soft and translucent, about 5 minutes. Add passata, basil, and salt. Cover and simmer over medium heat, stirring occasionally, until tomato sauce has thickened, about 20 minutes. Remove garlic halves before serving. Watch how to make authentic Italian tomato sauce! Instead of the onion you can use 2 shallots. If you have the time, you can simmer the sauce for much longer for a more intense flavor. The only difference is I add more garlic, and I roast the garlic. Everyone at my Thanksgiving meal loved the sauce. I even saved a little for myself and enjoyed it for dinner last evening. Next time I'll use 1/2 the onion and garlic. Very quick to make and that I loved. Excellent. Simple and quick to put together, but tasted great. Used dried Basil and added some Bay Leaves. Made this to use as pizza sauce. Delish! This was delicious! I didn't make any changes to the recipe. Great just as is.